Efficiency and enhanced performance for the warehouse: UniCarriers continues to develop the Logistics Analyser. The software for optimising logistics processes now includes ancillary equipment such as conveyors and mezzanine as well as enhanced 3D functions. The analysis tool displays the material flows of customers operations even more realistically to provide opportunities to improve warehouse processes and achieve potential cost benefits. In day-to-day business, companies benefit from slimmer processes, effective staff and Materials Handling Equipment (MHE) deployment, and improved handling performance. The Logistics Analyser forms part of the consultation service from UniCarriers. Using 3D animations and data driven reports, the sales representatives illustrate the material flow of a customer’s operation. Based on this, in conjunction with the information from the UniCarriers MHE database, they create a realistic fleet and warehouse concept that guarantees maximum performance. 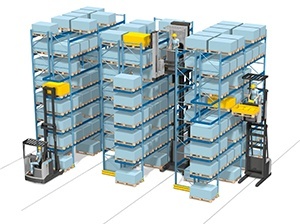 By means of simulations and layout drawings, customers see for example how storage capacity can be increased in an existing space and which strategies are best suited to slow or fast-moving goods. The solutions calculated here focus on the long-term efficiency of the processes: “It is not about using the Logistics Analyser to determine which forklift is the cheapest for a logistical task,” explains Tony Boynton, Product Manager Logistics Analyser at UniCarriers Europe. “In our simulation reports, we examine the total cost of operation – the overall costs of a solution. As well as operation of the MHE, the reports also include expenses for the storage space and staff.” The result is a detailed analysis of all operational functions which demonstrates how greater efficiency and improved performance can be brought about. In doing so, UniCarriers provides support to their customers to achieve reductions in the total cost of operation. The UniCarriers Group is a global developer and manufacturer of industrial trucks and offers solutions with load capacities from 350 to 10 000 kg. The flexible and individually customisable transport solutions for logistics and warehouses are manufactured at the company’s production facilities in Sweden, Spain, Japan, China and the USA. Distribution is carried out both through specialist retailers and directly to end customers by an experienced team of sales experts. Central buyers are the automotive, construction, electronics, food, logistics and pharmaceutical sectors as well as heavy engineering and the processing industry. The UniCarriers Group was created in 2011 from the mergers of the brands Nissan Forklift, TCM and Atlet. Today, the company is headquartered in Tokyo with branches in Europe, America and Asia. Its European headquarters are located in Meerbusch near Düsseldorf. In the 2013 financial year, the Group employed 5208 people worldwide and achieved a turnover of 1.314 billion Euros.